I love my Power Hitters Club community because members often stumble on new features before I do. Case in point: Reach Objective. 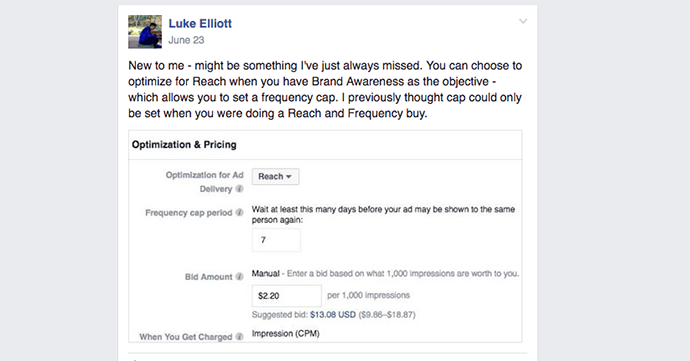 He said it was for the Brand Awareness objective, but it allowed him to cap frequency. I didn’t have it. Very few people — if anyone — had it. I completely forgot about it. I still didn’t have it for my main ad account. But after poking around, I realized that I do have it for one of my other ad accounts. 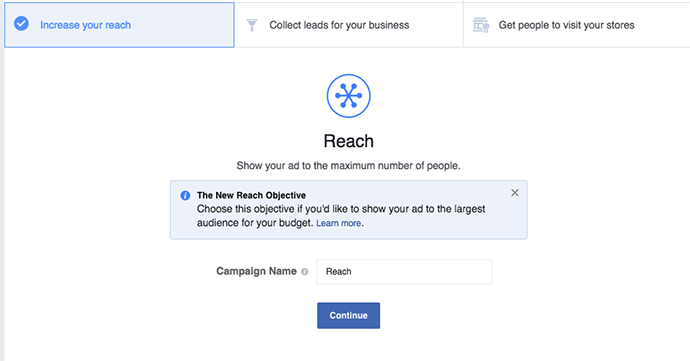 Choose this objective if you’d like to show your ad to the largest audience for your budget. Okay, so there’s a slight difference there. 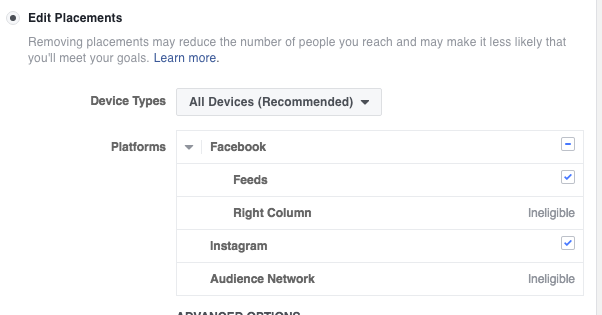 If you take that definition literally, Facebook is focused more on volume of impressions than the number of people reached. On one hand it’s controlled on the campaign side and on the other, the ad set. But the results — in theory — shouldn’t be much different. So why is Reach objective a big deal? Frequency capping. While 99.9% of advertisers (don’t quote me on that number, but it’s A LOT!) 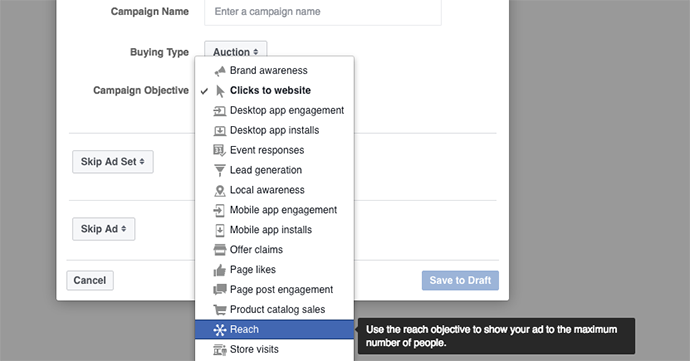 use the default “Auction” buying type at the campaign level, Reach and Frequency is an option. But it isn’t an objective. When Reach and Frequency is selected, only seven objectives are available (including the new Reach objective). You can’t target Custom Audiences. You can’t use manual bidding. You can’t do a lot of things. And you need a minimum audience size of 200,000 people in a single country to use it — typically with a rather high minimum budget. 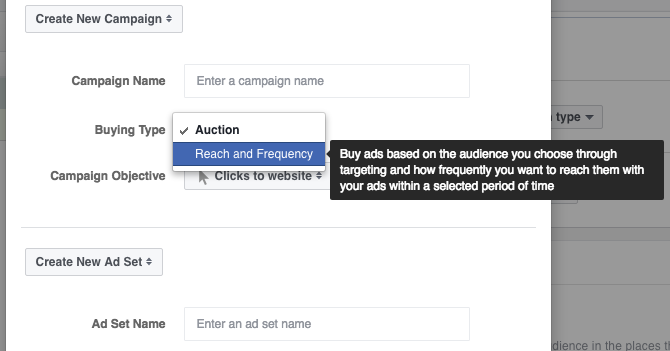 From the ad set, you can target Custom Audiences and multiple countries at once — just as you’d target normally. The only eligible placements for this objective are News Feed (desktop and mobile) and Instagram. No right hand column or Audience Network for you. And the big key here, of course, is frequency capping. This is a pain point for advertisers who often run into frequency issues. 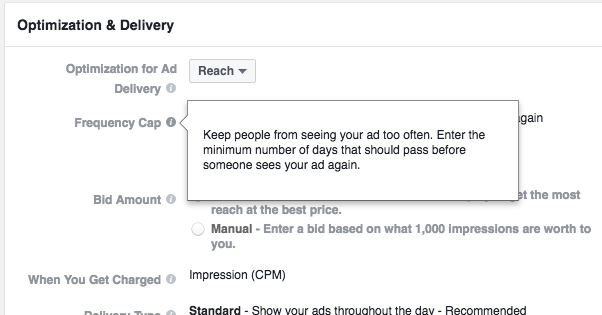 You can set a minimum number of days that need to pass before someone will see your ad again. We talked about this earlier. 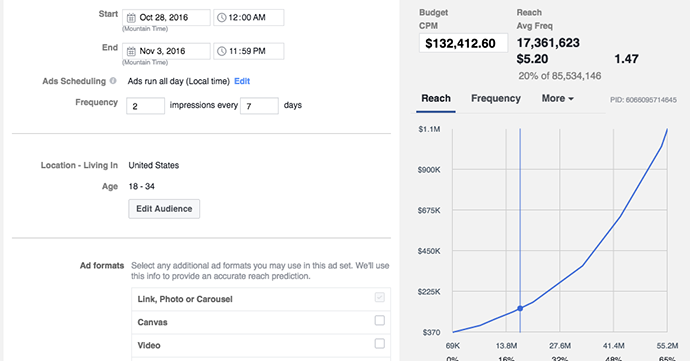 There’s a minor difference, but here Facebook is focusing on volume of impressions as opposed to volume of unique people reached. Advertisers only have the option to be charged for the impression. This would again be obvious. The focus here is on impressions, not on clicks. 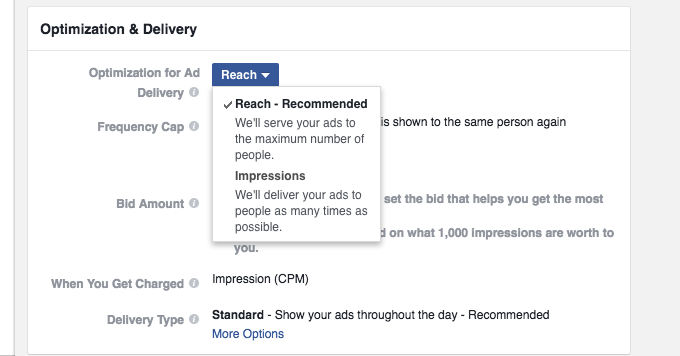 Up until now, advertisers could minimize frequency by using the Daily Unique Reach bidding option. It’s actually something I’ve used quite often — and recommended — when targeting a very small and (extremely) relevant audience. 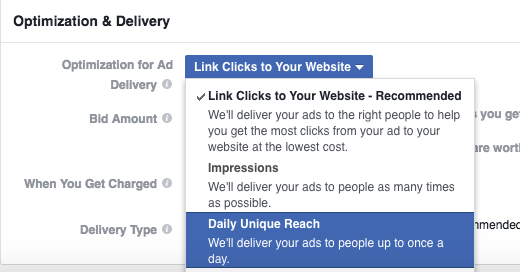 When targeting 500 people who opted in to a specific offer for an up-sell, for example, you wouldn’t want Facebook to optimize and reach only some of those people. But you’d also probably want to control your frequency. One of the issues with Daily Unique Reach, though, was that while you wouldn’t reach the same person more than once per day, you still may reach that person every day for a week. And that may not be preferred. That’s why Reach and Frequency was a disappointment to me and many others. I wanted to use it in place of Daily Unique Reach to give more control without changing my budget and targeting strategies. And that, my friends, is the beauty of the Reach objective using frequency capping. I will prefer this over Daily Unique Reach going forward. 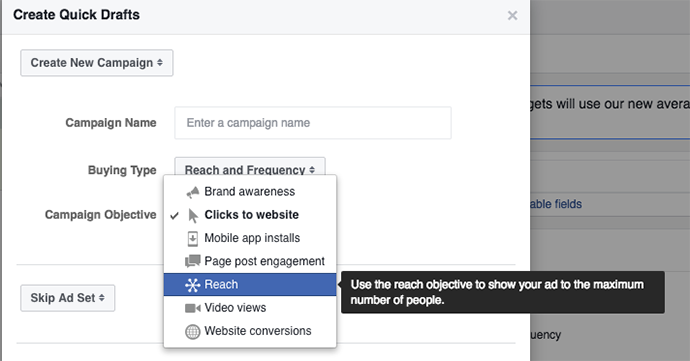 So if you have a highly relevant audience and you want to reach all of them without bombarding them with ads every day, this is a tremendous option. I’ll likely cap it at somewhere between 3 to 7 days. Onced a week may not be enough, and three three times may be too much. Ideally, I want to aim for twice per week. But of course, you won’t be optimizing for an action. 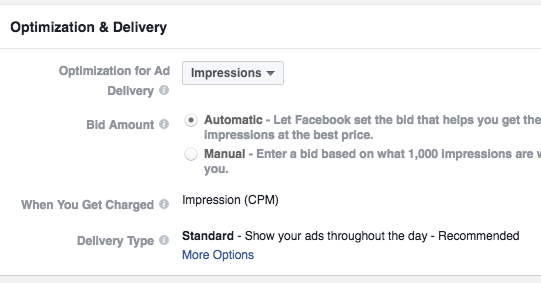 I still wish Facebook would allow me, for example, to optimize for website clicks and cap the frequency. As a result, I personally wouldn’t use this for cold traffic. I wouldn’t even use it for what most people would consider very relevant and targeted traffic. For me, it’s got to be a specific case where the audience is small and incredibly valuable, and I want to reach every single one of those people. 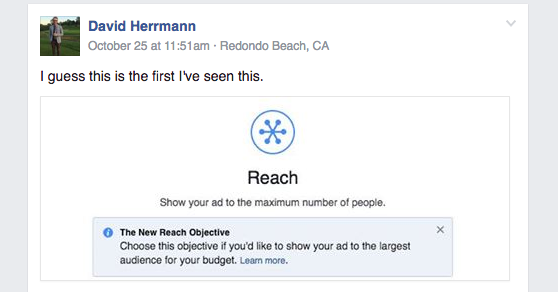 That said, it doesn’t mean that advertisers won’t find reason to use this for larger audiences. It can be used as a Reach and Frequency substitute when targeting broad audiences that aren’t allowed with R&F (more than one country or Custom Audiences, for example). There will be awareness value here, too. Let me be clear that I don’t know whether this is a test or a rollout. I don’t know whether Facebook has immediate plans for it. But it does appear that more advertisers are getting access to it, which can lead us to some conclusions. Do you have this feature yet? How do you plan to use it?